Indian Summer CAL week 6 – the last piece of the pattern – is out now for you to download on the Deramores website! In the last part of the pattern we’ll be putting all the pieces together, adding a little bit of width and working a border. Indian Summer CAL week 5 is out now for you to download on the Deramores website. In the fifth part of the pattern we’ll be making flowery squares! Indian Summer CAL week 4 is out now for you to download on the Deramores website. In the fourth part of the pattern we’ll be adding a ripple section to the two strips we’ve been working on. Indian Summer CAL week 3 is out now for you to download on the Deramores website. In the third part of the pattern we’ll be working on the two strips we made last week. Indian Summer CAL Week 2 – Out Now! Indian Summer CAL week 2 is out now for you to download on the Deramores website. Eeee!!! It’s so exciting! In this second part of the pattern we’ll be making the two identical strips of little squares. Indian Summer CAL Week 1 – Out Now! Indian Summer CAL week 1 is out now for you to download on the Deramores website. Eeee!!! It’s so exciting! In this first part of the pattern we’ll be making the three central squares. The awesome team at Deramores have asked me to pick two new colour palettes for the Indian Summer CAL. The Indian Summer CAL new colour packs use some of the latest additions to the Deramores Studio DK range. Indian Summer CAL for Deramores starts soon! Oh my, I’m so excited!!! 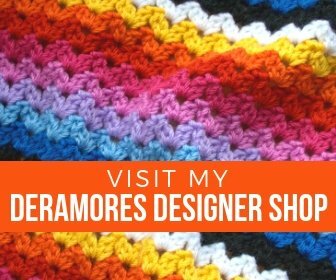 Deramores asked me to design their official crochet along this year and I’ve been a bit overexcited ever since! The Indian Summer CAL has been launched over on deramores.com and it will be starting very soon – eek! Here it is – look! !